I met a broken dog last week, and I could not take her home. Some of you are already nodding in quiet understanding, despite how little the above statement discloses. For those who are not, let me expound. This was not an injured dog. No scrapes, bruises or breaks were to be found. 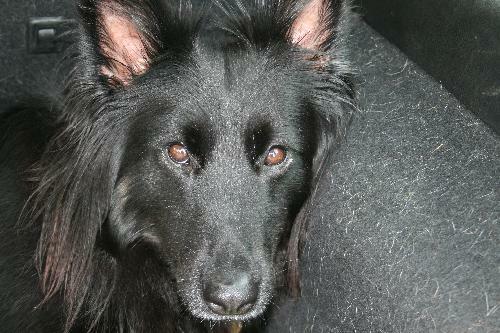 She was healthy and well fed, her deep black coat luxurious to the touch. 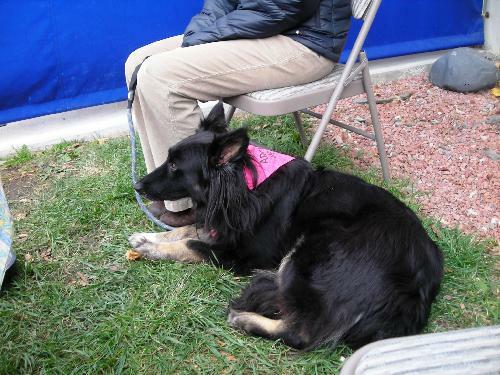 A Border Collie/GSD mix, she cut an athletic figure standing at the side of the rescue organization representative who was handling her at our local pet shop this day, and my guess was that she would find her way around an agility course with aplomb. A fine canine specimen in every physical sense of the word. Her eyes told the rest of the story, and I will never be the same for having looked in to them. It took no more than three seconds to know all that she could not tell me. Fear, distrust and uncertainty poured from her expression, and you could almost sense that she was looking for her next place to hide. She flattened perceptibly as I approached her. I spoke softly and held her head in my hands as she averted her eyes, a reaction that I am not used to. Most canines seem to sense that I am a dog nut and tackle me as soon as they have the chance. Not so, this girl. My wife and I exchanged knowing glances. These are the cases that kill us. I stepped aside to let Mrs. Author spend time with this shy, nervous girl, telling myself all of the while that the sooner we could distance ourselves from her, the better. Do not think me cold or uncaring. You could not be more wrong. Instead, understand that we have lost three great dogs in the past six years, and two of those dogs came from deplorable conditions and had horrid histories. 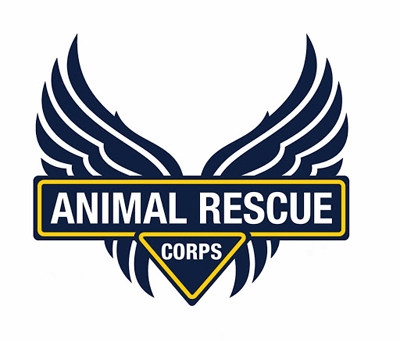 We committed fully to the challenge of helping these frightened animals feel safety. We put weight on them, trained them, showed them the way to true happiness and contentment. Our consistent love, patience and compassion taught them that they could expect good from humans, and that an outstretched hand did not indicate an impending strike. We gave them everything we had, as any who know us would attest. We helped each of them through prolonged medical battles until all was lost. Nigel and Sola bore witness to the loss of our last great friend, an amazing male Border Collie. His story will wait for another day, but the pain we all feel from his passing will not. He was far too young when we lost him. Nigel and Sola were both impacted deeply, and never seemed to fully recover until Truffles came home with us. It hurt us as much to see them mourn as it did to lose the companion they were mourning. Our entire family was devastated. I browsed the pet store that was hosting this rescue organization meet and greet. Mrs. Author found me, grabbed my arm and ushered me away after she had spent a few quiet moments with this sad and lovely girl. In her eyes I saw that familiar anguish. It pains us deeply to walk away from these cases. We want to know that these hurting creatures will be cared for in a permanent home that allows them to find their way back to a place of peace. We want to see them thriving, fearless, healthy and well; and we wish that we could be the ones to shepherd them as they find their way. The disappointment that comes from denying ourselves the chance to do so leaves us feeling hollow. With each damaged dog that we walk away from, we leave behind a small, broken piece of ourselves. I agonize over that dog each day, and she enters my thoughts with frequency. She nearly haunts me. I have looked at her online profile countless times, and imagined her frolicking in the river with our delightfully happy pack of dogs. I believe they would love her, as would we, and that they would not handle the loss well if (for any reason) things were to not work out. I know that this time, for many very good reasons, with the best intent, and my heart planted firmly in the right place, I must bid her farewell and hope. I met a broken dog last week, and I could not take her home. Please share her story, so that the person who is meant to do so may find her. She waits patiently. Mia is currently available for adoption at Good Karma rescue in Montpelier, Vermont. Her online profile is here. I rarely ask anything of our readers, but I implore you to retweet this story, share it on Facebook or anywhere dog lovers congregate. Help this girl find her forever home. Are you sure she isn’t waiting for YOU? Very touching post. We know exactly how you feel because it impossible to adopt them all. We’re sure the right ones will find her and give her the love she needs. Her story out out there now and it’s only a matter of time. I hope Mia finds a lovely home soon! Aww! So sad human Granny goes through this everyday she visits her ‘Save a Dog’ application on facebook.com. I am so sorry for her. Please keep us updated with her status. So many dogs to save, so little time!!! Will post her story on my blog Thurs. the older I get, the more sensitive I am to the pain of furbabies. My own, at age 11 is suffering from bladder cancer and the thought of life without her is unbearable. I appreciate your post more than you know. These babies have so much to tell us, about how we are all connected, all broken in some way and all need love and healing. And more than anything else, we can see how emotionally dependent they are on us, and how easily broken others who do not care can make them. God bless you. Thanks to your mum for posting this so I could see it. What a sad story. We should never have to look into sad eyes like that. We sure hope that she find a wonderful forever home.. It is said that a picture paints a thousand words. While that is true, what you have so eloquently illustrated with your words has painted a picture in my heart that will never fade. Those of us who have adopted, fostered and shared company with dogs who are frightened for whatever reason know the frustration and pain of wanting so badly to help. My heart goes out to you and your family as I’m sure it was difficult to look into Mia’s eyes when it brought back glimmers of the pain of losing your own family member and others that you have given unconditionally of yourself to help. I am dealing with my own challenges right now as my latest rescue was on the brink of death from starvation. I am trully saddened at times as I wish I could make her understand that she doesn’t have to “worry” where and when her next meal is coming from. Thank you for reminding me that it takes time and patience for her to trust. Bless you for sharing and especially for caring. I pray that Mia will find the home of someone who understands her needs as well as you. As Always, A Pleasure to be your friend! I know that your heart breaks because you cannot help her. I know the feeling- we understand. She is lovely and we are sending good furever home vibes. That is so sad. Hope Mia finds a home with understanding and compassionate people who love her and can gain her trust. Thank you for the link, the best I can do is donate. I also know the feeling of leaving obviously abused, shy dogs at various adoption groups and it tears me to shreds. I’ll just bet this post will help to find her the home Mia desperately needs and deserves. I know it must have been tough even to write about your experience, but we love you for it. I can truly empathise and confess to avoiding shelters! Both Martha & Bailey were rescues and I saw them on the website that both rescues had. I remember as a child my Dad took me to a Shelter to ‘chose’ a dog and like you my heart was breaking. There were so many whose eyes met mine and I desperately wanted to take home. I was so upset by the experience of knowing so many dogs are unhappy and need homes that I have avoided it ever since. I know there will be a great home waiting out there Mia – she looks such a great dog and like you I would love to see her happy and enjoying life. Sad yet sweet. We hope too that this special one finds a good hearted home. It’s heartbreaking to know that so many animals are mistreated or are looking for a loving home. But we cannot rescue them all. Sad thing is that they need to be rescued. It is as if I had written this post. I know that look and rescued one severely abused greyhound that took 3 yrs in my home before she became totally comfortable with the love we gave her (she wouldnt eat or drink around us and hide in corners to avoid human contact). Sadly it was only a few months later that she developed bone cancer and had to go over the Bridge. it tore a hole in my heart. Since then I have rescued so many abandoned and abused greyhounds and GSDs and have many pass at young ages due to their hard previous life. I cannot go to a rescue place without heartbreak since I have 5 dogs and cant take anymore in. My heart also cant afford to take in too many more or it will just break apart.I feel your pain in this story. I will post to my vet and see if they know of anyone who could help(and NOT call me this time!) Unfortunately there are too many Mias out in society. It really is tough and I can feel your anguish thru your post. By sharing her story, you may have helped her find a forever home. Been there done that. It really is so hard to see the broken ones. You have to think of your own pack to start with. She’s a beautiful girl and hopefully will find a great furever home soon. When I inherited Sonja (sheltie) from my late ex-mil (who got her at 4 yrs and had her for 3 yrs) it took a lot of training and consistency on my part to help her heal. She should have been placed in a loving home when she was young and not kept being shown when she hates crowds. I’ve had her for 3 yrs now and it took until 6 months ago to get her completely house broken, for her to actually want to eat without running, to go up to people asking to be petted. She is 10 yr old girl who is finally less broken. It breaks my heart….I’m in tears. We too had a border collie that we lost much too soon at age 7. I hope this girl will find the forever home that is meant for her and she will live out her days knowing love and security. Breaks my heart that we can’t help everyone! Thank you for this reminder, and we hope Mia finds her forever home soon. Your post brought tears to my eyes. This girl reminded me of our foster Elf, the one who crawled through our front door and urinated on himself every time anyone looked at him. They break your heart – but – there is a happy ending. Elf is with a family that has brought him out of his shell. He walks upright now, he doesn’t dart and hide when someone looks at him. He stopped shaking and now snuggles against them while being loved. These wonderful people adopted Elf even though they had a house full of white carpet & he wasn’t house broken. They bought a carpet steamer and didn’t look back. Somewhere out there is the right home for this girl, she will touch the right person’s heart and blossom as she learns trust does not equate pain. She sounds like a dog that we would like to help, too, if we could. Trixie and Dennis both had similar fear and trust issues at first. Hope she finds a good home. This post describes why I cannot attend adoption fairs. I used to belong to a knitting circle that would meet, at all places, at the local animal shelter. I finally told the group’s leader I could not come any more, the vibes there made me too sad. I hope and sincerely pray that sweet Mia finds a loving, sensitive, forever home. For now it appears she is in safe hands. God bless her and all of you and the Commenters for your caring and compassion for our canine buddies. We have a feeling this sweet girl will find a furever home in no time! I’m sad for the sad endings. But happy that there are real happy endings. I hope sweet Mia finds the perfect home soon. Her story brought tears to my eyes. Well, now, this hits close to home.. But like others said, you can’t help them all. Remember the ones you HAVE helped, and think about the future life that Mia will have with someone else. Those situations ALWAYS break my heart. When my house got full, I started volunteering for the local humane trying to save all that I can. I still mourn for all of those that I still can’t help. I know you would have liked to help this poor one. First because of WHO ou are and second in reaction to this time of year. Remember that no family can do EVERYTHING. I do agree with what Wild Dingo said. I was born very shy and nervous. I use my blog to be the dachshund I WANT to be. My mom and dad have helped me so much. When I was first adopted I spent most of my time hiding under the table or behind the cliner chairs. Now… my life is sooo much better. I am stronger mentally every day. Maybe Mia just didn’t click with YOU. Just before reading your post, I received an email of yet another Siberian Husky in my local shelter (I get the call about every Sibe) and I know your anguish. I simply can not help everyone that needs it, I can only work through contacts to see that she is given a chance. The broken ones are the hardest – and the ones I always seem to take on. They take so much work and so much patience, but they ingrain themselves into your heart so deeply. Our hearts go out to this beautiful dog and hope she finds a good home soon! Sadly, I know exactly what you mean! We’ll mention her when we get the chance. She’s a beautiful girl and I am sure that she will have a deep impact on someone! Best of luck, Mia! Thank you for this post. Sometimes things are not as they seem and an otherwise healthy looking dog may have been deeply traumatized by cruelty. Our Lucy, adopted 4 months ago, was in similar condition psychologically (although she also showed some physical signs of abuse, having been left to starve). 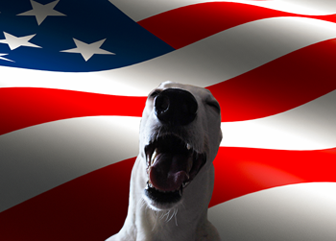 Dogs with wounded hearts and minds need and deserve special care and treatment. I understand your pain at having to walk away, as we have made the decision that we just cannot care for more than two dogs. I’ve tweeted and FB’s about Mia in hopes of helping you spread the word about this beautiful girl. I hope she finds the compassionate humans who can help her find joy again! Tough times for you, tough post for me to handle. Wild dingo could be right. I have a Yorkie that has been fearful since I got him at the breeder. But is such a loving sweet dog for 12 years now! Your heart aches now, as does my own. Hopefully she will find a true love. I hope she finds a great home soon. I know how you feel. oh boy, do i understand…in my profession i see animals in need all the time, sometimes it is overwhelming to me…i can not save them all…but like you, when you have that feeling for a certain animal, i will do everything i can to help them find love….even if it isn’t with me…. your a kind soul with a gentle heart…we need more like you! It is so hard to turn away from a dog in need. But we can only do so much. I hope that sweet girl finds a home. Been there, felt that many times especially when looking for Chester. I still remember a very sad animal shelter we visited with the majority of dogs running loose but the one cowering in the corner I will never forget. I wanted so bad to hold him and tell him it would be OK, but knew my approach would only make him more fearful. I wish I knew the answer for helping all the hopeless cases but I don’t. Your post today may be the answer this sweet girl needs and will lead her to her forever home. Even if it doesn’t you can rest well knowing you tried. oh sweeties, Mr. & Mrs. Author, my heart breaks. I know how this is as I feel it often when I meet dogs like this or have heard of horrid stories behind the rescued dog. I don’t mean to belittle your encounter or instincts, but the flip side to her behavior “could” really be the result of being born fearful. Truly. And because of that, landed in home-to-home with people who could not understand her. She may not necessarily have a “horrific” past life, it just may be that her personality was greatly misunderstood by those who owned her, which probalby has only impacted her more and reinforced her fear. Some dogs truly are born with predispositions to fears. 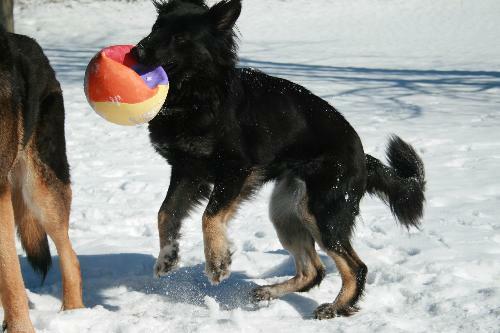 GSDs and GSD mixes have these types of quirks, as I am learning by working with one and around many pure bred GSDs. But I can’t and wouldn’t discount your instinct, just offering another probablity to her behavior. Most dogs will never look a person in the eyes. It takes a long time for a dog to do that as it is not in their nature to do so. Looking into the eyes from a dog’s perspective is considered rude or confrontational. She averting because that was her calming singal to you. Its a very natural instinct for even the most friendly non-fearful dogs and takes some training to get a dog to look into your eyes, as you know I’m sure. I will share this post. She’s beautiful and needs and deserves a home who understands fearful dogs. No matter if it was genetic or environmental, it doesn’t matter. What matters is someone who can take it on with great compassion and patience. What a sweet looking girl. She reminds me of our Sadie (her picture is on the lower right side of our blog. She was a rescue, too. As you saw on Country Corgis, we do foster care every once in a while for my sister who does rescue work. In fact, Buddy, OC’s father (our first corgi) was a rescue that we found running around in the street and no one answered our ads in the paper. Thank you for commenting on my blog :o) This sure is a heart breaking post – I hope all the best for Mia.